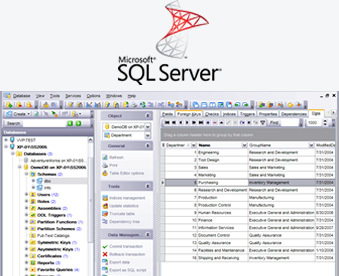 Microsoft SQL Server Programming answers your ever increasing database need. Software Island, in collaboration with SQL Server Programming, provides supreme DBA and remote DBA services. Software Island has wide experience in SQL versions SQL server 2000, SQL server 2005, SQL server 2008, SQL CE 3.0 (Mobile Edition) & SQL CE 3.5 (Mobile Edition). One of Software Island's core focuses is in terms of SQL Server Technology Application is the Microsoft .NET Framework to the likes of leading solutions providers offering Microsoft .Net Development in India. The finer functional capabilities of applications offered on the .net application framework enable us to ensure a high degree of scalability, robustness & device interoperability with the applications that are developed. Because of loads of skilled resources on the Microsoft platform, Software Island offers MS SQL Server Hosting & Development to customers’ world wide in USA, UK, India, Singapore, Hong Kong, Dubai, Canada, Germany, The Netherlands and South Africa.